Turkey plans to construct 22 new dams in the South Anatolia region but such a decision has already sparked concern of Iranian authorities, as this construction will lead to the drying up of two major water sources for Iran. Sputnik discussed this issue with an Iranian environmentalist. Iran’s head of the Department of Environmental Protection, Masoumeh Ebtekar, has called on the Iranian Foreign Ministry to help convince Turkey to abandon its plans for building dams. As Ebtekar said, the Foreign Ministry should hold talks with Turkey to persuade the government to abandon this venture and uphold the right to the waters of the Tigris and Euphrates rivers. Ebtekar criticized Turkey for the reckless construction of giant dams, which leads to the drying up of the rivers. As part of its ambitious project in the South Anatolia region, Turkey plans to build 22 dams. President Hassan Rouhani also expressed discontent with Turkey over this. Speaking at the recent International Conference on Combating Land Desertification and Dust Storms in Iran, he strongly condemned the construction of dams by Turkey. According to him, the irrational construction of these dams will lead to the disappearance of marshes and the drying up of lakes, both in Iraq and Iran. The remnants of construction work also contribute greatly to dust in the region. The Turkish authorities, including the deputy foreign minister for South Asia, did not agree with such criticism at the conference, saying that dam construction is carried out with all precautions, norms and it cannot harm the environment. However, Iranian environmental experts say otherwise and are quite alarmed by this. According to them, if it is not possible to stop this by the process of diplomacy, then the countries will be on the verge of a war over water. Mohammad Darvish, the director of the public department of the Department of Environmental Protection in an interview with Sputnik said that Turkey is taking advantage of the political situation, such as the weakness of the central government in Iraq, as well as chaos in Syria to begin the construction of its 22 dams on the Tigris and the Euphrates. “One of the dams called Ataturk is the largest dam in the world, which was built on the Euphrates River. Its volume is 48 billion cubic meters, which is equivalent to the volume of one hundred Iranian dams. If we sum up all the dams built by Turkey on the Euphrates, it measures to 100 billion cubic meters of water,” Darvish said. He further said that if Turkey succeeds in constructing the Ilisu dam in the Hasankeyf area on the Tigris, with a volume of 10.4 billion cubic meters, then a real water crisis will erupt. “In other words, 100 percent of the water from the Euphrates River and 60 percent of the water from the Tigris River will be blocked, nothing will come to the lands of Syria and Iraq,” he said. The environmentalist explained that for farmers, such a catastrophe results in unemployment and poverty. Moreover, it even plays into the hands of terrorist organizations such as Daesh. “About 90 percent of the recruits of this terrorist organization were from among the unemployed residents of these dried out and desert areas,” Darvish said. The Iranian Energy Minister, Hamid Chitchian, also stated that the dam construction projects in Turkey "have a great impact on the environment in Iran," citing the fact that they cause a chain reaction drying out the rivers. 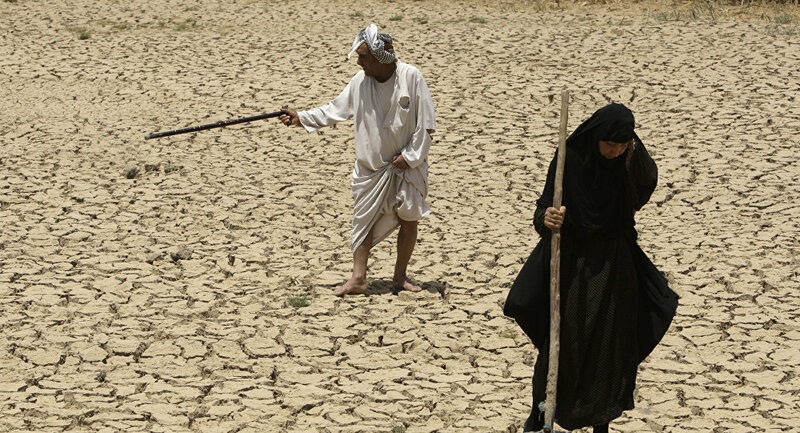 According to him, these dam constructions have turned once fertile Iraqi farms into major sources of dust and sand storms and this has in fact affected the climate of 20 Iranian provinces.